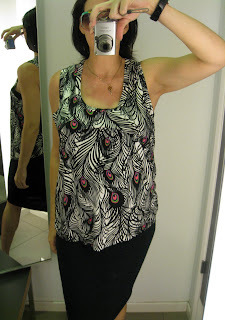 Yes, Dahling, you are a fabulous bird print tunic. $69.90, & I think this was the last one left. Annnd, the pregnant view. Not bad. 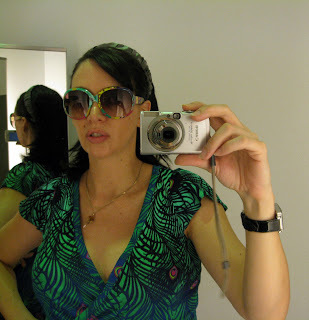 Who'd have thought I'd find maternity in Matthew Williamson? 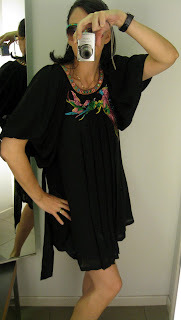 Fabulous bird tunic #2: the awkward blogger pose, and the patented Armed & Akimbo hunch, which kind of hurt the belly so I couldn't really do it proper. This one sets you back $199, which really, truly hurts. This wrap dress is OK. Still, wouldn't spend $59.90 on it. My pose is telling you that. Yuk! Dowdy maternity! But it is a more reasonable $24.90. Sunglasses up close, $34.90: working the pensive look, & gratuitous belly shot w/sunglasses proving the versatility of an M. Williamson tunic. End w/kooky pose. I adore this heart T/cover-up, great maternity, $29.90. Go and seek out the tunics (they are going fast), the bikinis and tankinis (there were lots of these), the cute T-shirt coverups, and the sunglasses. I'm iffy on the bags for almost $100, but Herald Square has tons of them. Not so many sunglasses. 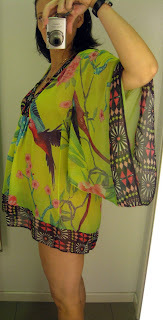 Oh I love bird tunic #2, and you look fabulous in it. Hi there-you look gorgeous in all the pieces my dear! Have a great weekend! That first one looks fabulous on you! Beautiful! And you have great legs!!! I had no idea you were preggers. CONGRATS!!! 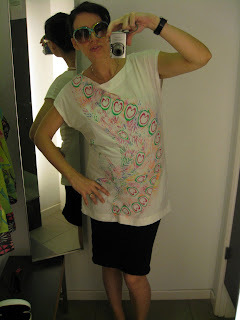 And that tunic is TDF! I have to go get that. Wow. You should be like a maternity model. You look sooo fab! Please get the first one! Plus, you look absolutely beautiful.